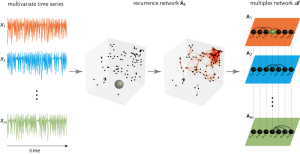 Members of the QUEST team have published a new approach for analysing multivariate proxy records with recurrence networks. The idea is to first consider each proxy separately as a recurrence network, then combine them as layers of a multiplex network, and derive a similarity measure from this resulting multiplex recurrence network. This approach can be used to reveal periods of converging dynamics or very disperse variability, as demonstrated on an example of palaeo vegetation development during the last 16 ka in East Asia.